" James Fisher Prop. " Picture taken on Gouin Blvd. in front of Sacré-Coeur hospital. 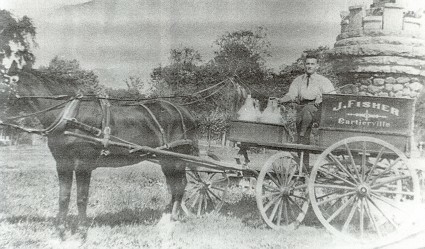 Mr. Arthur Corbeil delivering milk with the "Cartierville Dairy" sleight. The last pint could belong to another "Cartierville Dairy". 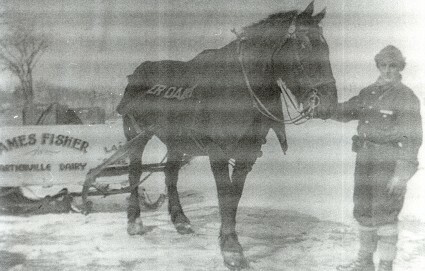 Mr. Laurin remembers another dairy that was situated on Guertin St. in Cartierville. The owner of this last dairy was " William Fisher " he said. 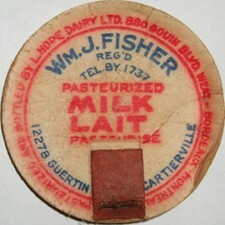 Searches for " James Fisher "
but the word "Milkman" does not show! 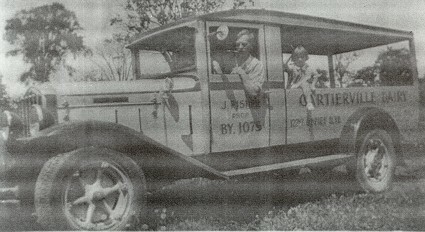 As you can read on trucks, the dairy was situated 12217, O'Brien Blvd. and the phone number was : BY 1075. Mr. James Fisher and his spouse were born in England. The couple had a daughter. 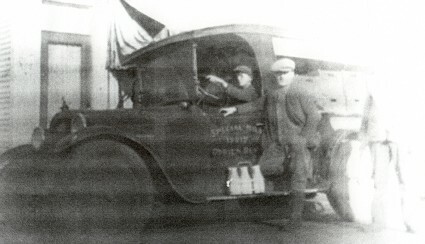 They started the milk business in 1920 or 1921 and sold it to the "Hope Dairy" around 1960. Mr. Fisher passed away at the end of the 80's. Source : Mr. Robert Laurin, one of the best friend of Mr. James Fisher!